Most drivers have a slow cooker in their cabs. If you don't you may want to think about investing in one. 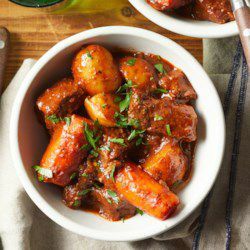 We posted about slow cookers in this blog from a few months ago: http://www.globaltransportinc.com/blog/post/simple-cooking-simply-awesome With the cold weather upon us, we figured we'd share one of our favorite recipes for beef stew that you can cook in your slow cooker. Slow Cooker Beef Stew that you can make at home or in your truck! 1. Place beef in a large bowl and season with ½ teaspoon each salt and pepper. Add flour and toss to coat. Shake off excess flour back into the bowl and reserve. 2. Heat 2 tablespoons oil in a large skillet over medium-high heat. Add about a third of the beef to the pan. Cook until brown on all sides, about 4 minutes. Transfer to a 6-quart slow cooker. Add 1 tablespoon oil to the pan and cook the remaining beef in 2 more batches, adjusting the heat as needed. Transfer to the slow cooker. 3. Add the remaining 1 tablespoon oil and onion to the pan. Cook on medium heat, stirring, until soft, about 8 minutes. Add the onion to the slow cooker along with potatoes and carrots. Add wine to the pan and scrape up any browned bits. Pour into the slow cooker. 4. Whisk broth, tomato paste, thyme, bay leaf and the remaining ½ teaspoon each salt and pepper into the flour left in the bowl. Pour over the stew ingredients and stir well. 5. Cover the slow cooker and cook on High for 4 hours or on Low for 7½ hours. Serve the stew sprinkled with parsley, if desired. These are all ingredients that you can prep and freeze in advance. You can also prep them and keep them in a cooler for a couple hours until you're ready to throw them into your slow cooker on the truck. Beef stew is a great way to stay warm in the winter, especially in your truck. And it's delicious!